Unless you have a 30-inch monitor, why pay more? Just how much are you willing to pay to have the fastest graphics card? That's always been a tricky question for PC gaming enthusiasts. But with the release of ATI's latest performance graphics chipset, the Radeon HD 4870, it's become a real conundrum. 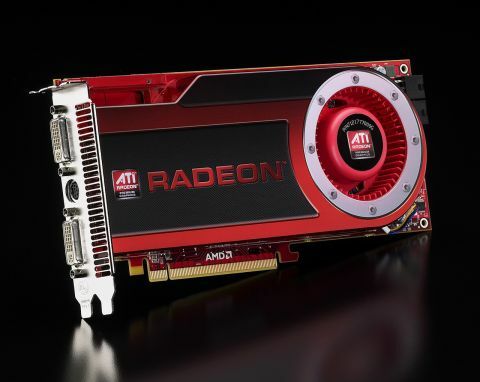 That's because AMD's graphics subsidiary has given up chasing the outright 3D performance crown. It is no longer even trying to create the fastest single GPU on the planet. Instead it has shifted its focus towards efficiency and value for money. As we discovered last week with our first look at the entry level member of the Radeon HD 4800 series, the 4850, ATI has done a stunning job. The 4850 is yours for a piffling £125 but delivers more performance than the fastest single-GPU graphics card available just a few months ago. As good as the 4850 is, however, the new 4870 variant is even more impressive. Yes, it costs 50 per cent more than the 4850 but doesn't quite deliver 50 per cent more performance. The 4850 still offers the best 3D bang for buck. But the 4870 has an even better party trick. It makes the latest uber-GPU from arch rival NVIDIA, the GeForce GTX 280, look massively overpriced and just a little bit silly. You can find full technical details of the silicon gubbins that lie at the heart of the 4870 in our original Radeon HD 4800 series review. But to recap briefly, the really clever bit is how ATI has managed to up the shader and texture count by 150 per cent courtesy of a boost in transistors of just 40 per cent. In many respects, the 4870 is no different from the cheaper 4850. It has the same 800 shaders, 40 texture samplers and 16 render output units. Likewise, it sports an identical DirectX 10.1 feature set (something NVIDIA cannot yet match, for better or worse) and the same 256-bit memory bus and 512MB frame buffer. But that's no surprise. After all, both are based on the RV770 GPU. The 4870, therefore, is all about clockspeeds. In terms of core frequencies, it ups the ante by 125MHz to 750MHz. However, the big news is memory clocks. The 4850's GDDR3 memory trundles along at a relatively pedestrian 2GHz. But ATI has bolted the very latest 3.6GHz GDDR5 chips to the 4870. That's an extremely important upgrade because NVIDIA's beastly GeForce GTX 280 has the advantage of a much wider 512-bit memory bus. Factor in the GTX's 2.2GHz GDDR3 frequency and it retains a raw bandwidth advantage. But it's nothing like as big as it would have been had ATI stuck with GDDR3 for the 4870. The only other significant difference is a change in form factor and power consumption. The 4870 is a dual-slot board that requires two six-pin power cables where the 4850 is a single slotter that can survive with a single power cable. Anywho, you can read all about the GTX 280's architectural nitty gritty in our review. What you really need to know is just how close the 4870 gets to NVIDIA's finest. And remember, prices for the 4870 kick off at just under £200. You'll do well to get any change out of £400 for a GTX. Our first performance test is the 3D technofest that is Crytek's Crysis. It's both the most advanced and most graphically demanding PC game yet. With all the image quality options set to full reheat, it will bring any video board to its knees. The Radeon HD 4870 is no different in that regard. But crucially it makes almost as good as fist of coping with this particular graphics Crysis as the NVIDIA GTX 280. Running at the popular 1,680 x 1,050 widescreen resolution and all the options set to maximum (but without anti-aliasing enabled), the 4870 cranks out 21fps on average. The GTX manages 26fps. That's a performance delta of 24 per cent. In both cases, you'll need to knock a few of the options down a few notches to get acceptably smooth performance. Moving on to one of the most popular current shooters, Call of Duty 4, the 4870 gets even closer. At 1,920 x 1,200 and 4x anti-aliasing, the 4870 manages 58fps to the GTX's 64fps. That's a difference of just 10 per cent. More importantly, it's small enough that you'll really struggle to feel the difference in game. It's almost the same experience for around half the price, in other words. What's more, even at a monstrous resolution like 2,560 x 1,600, the GTX is only 18 per cent quicker in Call of Duty 4. It's a similar story running an older favourite like Half-Life 2 at 1,920 x 1,200. Here, 102fps for the 4870 plays 122fps for the GTX. It's all throughly impressive. But do we have any reservations at all? As things stand with the current configuration, we do wonder whether the 4870's 512MB frame buffer has the legs for the long term. Future game engines are likely to gobble up ever more graphics memory. It's a concern today, too, if you own a 30-inch monitor capable of that exotic 2,560 x 1,200 resolutions. Run Half-Life 2 at that resolution and the GTX pulls out a 28 per cent performance advantage. That also reflects the fact that the GTX is a bigger chip with more raw throughput. Having spoken to a one or two of ATI's legion board partners, we can confirm that 1GB 4870s will indeed hit the shops in the next month or so. But given the new fangled GDDR5 chips ATI has selected, just how much of the 4870's impressive price advantage will the extra memory eat up? The only other slight worry is the immense heat this card pumps out. It's a bit surprising given that we found it consumes approximately 35 watts less than the GTX 280. And it doesn't bode all that well for the longevity of these cards. Nor does it help keep the rest of your system cool and stable. There are two further points in the GTX 280's favour that should not be forgotten. It may not be by as much as NVIDIA would like. But the GTX is still the fastest GPU on the planet. Expensive as it is, its massive bandwith and pixel parallelism also make it the weapon of choice for gamers lucky enough to run really big LCD panels beyond 24 inches. However, for everyone else, the good news is that there is little reason to pay the £400 NVIDIA is demanding for the GTX 280. Incredibly, ATI has come up with a GPU that delivers a remarkably similar gaming experience for half the price. On a final note, it's worth remembering you can pick up two 4870s and run them in CrossfireX multi-GPU mode for the same price as a single GTX 280. We've never been big fans of either Crossfire or NVIDIA's competing SLI platform. But if you do have £400 to spend, a pair of 4870s will take some beating.